Babalawo, Santeria’s High Priests by Frank Baba Eyiogbe is Out! Hidden within the mysterious Afro-Cuban religion commonly referred to as Santeria, there is an even deeper body of secrets and rituals known as Ifa, practiced by a group of priests known as babalawos, or “Fathers of the Secret.” Babalawo, Santeria’s High Priests pulls away the veil of secrecy surrounding Ifa to reveal exactly what Afro-Cuban Ifa is and how and why it works. 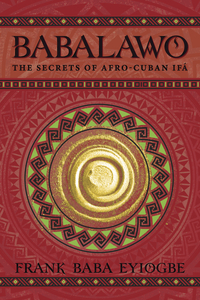 This book is an in-depth look at the most secretive branch of Santeria as seen through the eyes of an insider: a babalawo with over eighteen years experience living and working Ifa in both the United States and Cuba. Babalawo, SanterÃ­a’s High Priests from Llewellyn Worldwide is due out in February 2015 and is available for pre-order now at: Llewellyn Worldwide’s website. 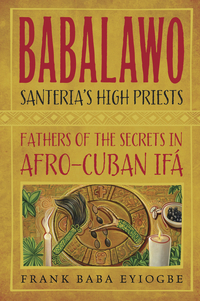 Frank Baba Eyiogbe, author of the upcoming Llewellyn Worldwide book “Babalawo, SanterÃ­a’s High Priests” due out in February, has been practicing Santeria for over twenty-five years: twenty-three years as a santero (Orisha priest) and eighteen years as a babalawo (initiated in Havana, Cuba). Frank has achieved the highest level of babalawo, “Olofista.” He created the premier Santeria website www.orishanet.org, and has been a guest on NPRâ€™s All Things Considered and The Global Guru and was interviewed for LIFE magazine. He has guest lectured at the University of Washington as well as UC Berkeley. We are babalawos… Working IfÃ¡ in Havana, where they work IfÃ¡ the hard way, without gloves. You can try the forums on http://www.orishanet.org. That way people in your area may be able to point you to a good babalawo to help you.